Powered by PrecisionCore, this all-in-one delivers fast, high-quality prints, up to 50 percent lower printing costs vs. colour laser1, up to 580-sheet paper capacity, auto 2-sided print/copy/scan and 30,000-page monthly duty cycle2. Introducing PrecisionCore, the next generation of inkjet printing technology. From professional and industrial-level printers to your desktop inkjet, this groundbreaking technology delivers fast printing with superior quality results. A truly innovative system, PrecisionCore features Epson's advanced thin-film piezoelectric (TFP) elements, which are produced via the MEMS manufacturing process, based on semiconductor micro-fabrication techniques. At the core of this proprietary technology is the PrecisionCore MicroTFP print chip, a digital chip that prints at the micron level - 1/100th the size of a human hair. It's this extraordinary focus on accuracy and detail that enables PrecisionCore to deliver revolutionary results, whatever the task at hand. The WorkForce Pro WF-4640 delivers professional quality, two-sided colour prints at super fast print speeds, making it easy to increase productivity, without compromising quality. Boasting drastically improved print speeds of up to 20 ISO ppm (black) and 20 ISO ppm (colour), any project can be handled with speed and ease. The WorkForce Pro WF-4640 boasts 2 x 250-sheet paper trays and also includes an 80-page tray for envelopes, labels and specialty media for efficient paper handling. 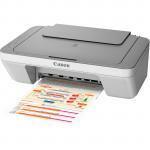 Additionally, the two-sided Automatic Document Feeder will copy and scan one- and two-sided originals. The 35-page Automatic Document Feeder enables quick faxing of one or two-sided documents. Faxing speed is as fast as 3 seconds per page, including 550 page memory capacity with storage of up to 200 numbers. For enhanced productivity, PC-Fax is included allowing a fax to be sent directly from a computer. Save up to 50% lower printing costs than colour lasers. With the extra-large, high capacity 786XL cartridges, users can print more than four reams of paper at a time before changing cartridges6. Utilising the 786XL cartridges, the WorkForce Pro WF-4640 achieves a yield of approximately 2600 pages in black and 2000 in colour. Alternatively, for users with lower print volume requirements, the 786 cartridges can achieve a yield of approximately 900 pages in black and 800 in colour. Replace only the colour you need with affordable, individual ink cartridges. With the WorkForce Pro WF-4640's automatic, two-sided printing and copying, users can save up to 50% on paper supply. 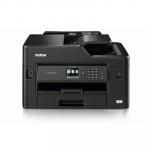 In addition, the WF-4640 saves energy by using up to 70% less power than laser printers5. 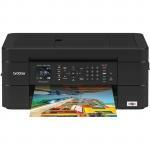 To maximise office productivity and efficiency Epson have designed and engineered the WorkForce WF-4640 to be jam-free. A durable performer, the WorkForce Pro WF-4640 boasts a duty cycle of 30,000 pages2. This dependable workhorse also comes with a one-year return-to-base warranty for dependable service and support. 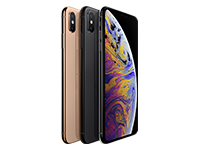 Phone support is included, without charge, for the life of the product. 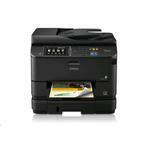 The new WorkForce Pro WF-4640 features a new paradigm of mobile printing convenience. Epson Connect and other supported services give users the freedom to print photos, documents and web pages wirelessly over a home network, or even remotely from anywhere in the world. 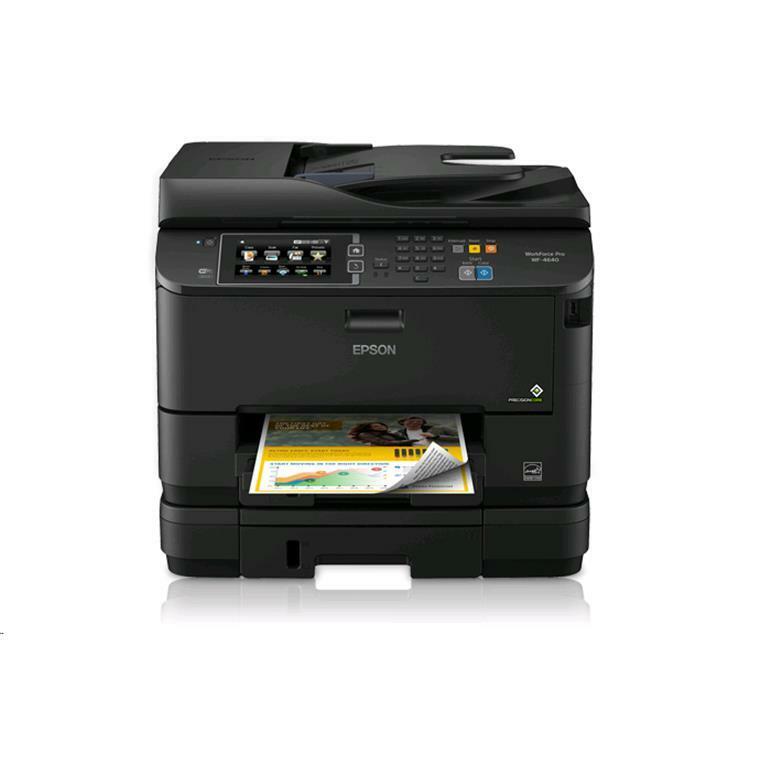 Epson Connect comprises of Epson Connect Email Print, which allows customers to print electronic mail and file attachments by sending them to an e-mail enabled Epson printer. Also part of Epson Connect is Epson iPrint support, empowers users to access, print and save photos and documents on iOS devices. Users can also scan them to their devices or send them via email. 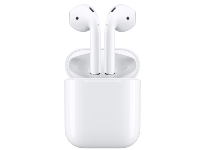 This application can be downloaded free of charge from the Apple® iTunes® store. 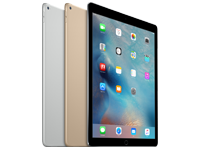 Support for AirPrint enables direct wireless printing from iOS devices, without the need for additional drivers or software downloads. Google Cloud Print support allows users to print out documents, spreadsheets and presentations stored on the Google cloud. This is ideal for Epson users who need to create, access, edit and print their documents while on the move. 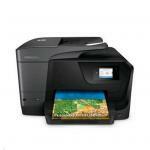 Google Cloud Print is compatible with a wide variety of mobile devices. The WorkForce Pro WF-4640 is Wi-Fi CERTIFIED enabling networking which delivers up to 2.5 times the performance of the previous standard 802.11g6. The WF-4640 features Wi-Fi Direct enabling users to easily connect to wireless networks in seconds, allowing printing from virtually any room in the office. The WorkForce Pro WF-4640 features a large, intuitive touch panel for quick and easy navigation through critical tasks. 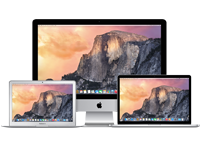 Smart and simple icons make any task easy. The WorkForce Pro WF-4640 will scan and save electronic copies of printed reports, or turn documents into editable text with the OCR software included. 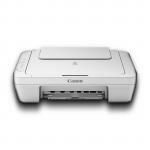 Additional features include scan-to-PDF. The wireless connection enables the user to select a computer to send a file to the printer's USB port and allows files to be uploaded straight to the PC. Exclusive to Epson, DURABrite Ultra Ink is a versatile pigment based, 4 colour ink technology which delivers brilliant, ultra-sharp detail on plain and specialty papers. These fast drying inks deliver durable prints which are water, fade and smudge resistant, as well as highlighter friendly.